If you don't know what we're talking about, I hope you aren't too chilly from being frozen in ice for the last month! Go look at our Munchkin Shakespeare Kickstarter and then come back here. We've had some questions about the expansion that's exclusive to Kickstarter backers. Here's a quick FAQ. Q. What's going into this expansion? A. Right now, some game cards, some Dungeons, some blank cards, a journal, a bookmark, a Kill-O-Meter, and a coin. We have more content planned! Q. How big is the expansion? A. It's a box the same size as a regular Munchkin game. We need the space to fit all the swag that's going in there! Q. I want a copy for my buddy who can't pledge to the Kickstarter. Can I get an extra one? A. Sure! As long as you backed at the $20 tier or higher, you can add $15 to your Kickstarter pledge directly or add $15 in BackerKit after the Kickstarter has ended. Adding it now helps push us over the next stretch goal, so we'd be thrilled if you did that, but do what's best for your bank account. Q. I can't back the Kickstarter, unfortunately. How can I get one of these expansions later? A. See if you have a friend who's a backer and ask them really nicely to order you one. Or see below . . .
Q. Is the expansion going to be available in stores? A. If a store is in our Store Finder, they'll be getting an email at the conclusion of the Kickstarter with instructions for ordering Shakespeare and the expansion (and all the unlocked add-ons they want!) for their shelves. Q. So the expansion won't be going through regular distribution? A. Nope. It's only available through this Kickstarter or to stores in our Store Finder. Q. Are you going to reprint it later? A. No. Once we sell through the copies we printed, they're gone forever. Q. I don't want to miss out! How can I make sure to get a copy? A. 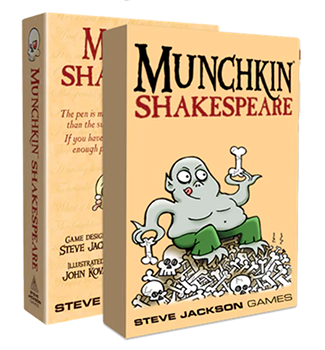 Go to the Munchkin Shakespeare Kickstarter page and pledge at the $20 tier or higher to be able to add the expansion in BackerKit later. If you pledge at the $35 tier, you'll get Shakespeare and the expansion, and if you pledge at the $60 tier, you'll also get all the unlocked add-ons: a second Kill-O-Meter, blank cards, pawns, dice, and more stuff to come!